More and more Americans suffer from food allergies than ever before. In fact, it is estimated that one out of every 13 children suffers from a life threatening food allergy. 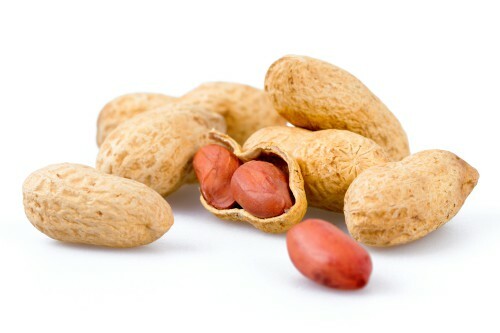 Click here to learn more about food allergies from Food Allergy Research & Education, Inc. If you are making food for a person with allergies, remember to separate their food, working surfaces and utensils from the allergen food. It is also a good idea to protect their food by preparing it first, before the allergen item even touches the kitchen surfaces. Once their food is safely prepared and put away you can begin working with the allergen item(s). Click to view an enlarged version of the Big 8 Allergen Food Items. 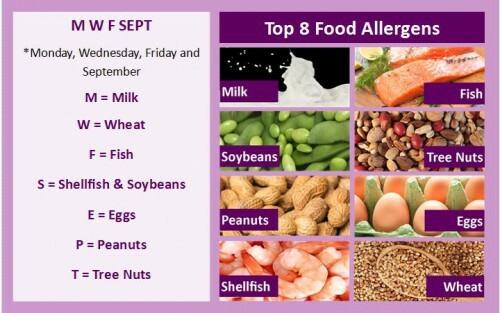 The big 8 allergen food items cause 90% of all food allergies. These foods could cause allergic reactions by themselves or when used as ingredients of other foods. For example, a person with a tree nut allergy cannot eat baked goods containing nutmeg which is an example of a tree nut. There are other common foods that can cause allergic responses too. If you have an allergy be sure to read labels carefully so you can spot foods that might be dangerous. Never eat foods if you are unsure if they aren’t labeled. If you are having an allergic reaction after eating foods take medications prescribed by your doctor and call 9-1-1 immediately! Some signs and symptoms of an allergic response can be viewed here .